Yes, those are tights you see on my legs. We shot this look in -15 and going bare legged was just not an option on a day like this! Looking chic but keeping warm is just one of those struggles in the winters months that I often have a hard time with. When you're forced to wear multiple layers, warm boots and thick coats - you feel like showcasing your style can easily be lost. I like to opt for turtlenecks that contrast with my winter jacket and some serious neck bling. Bold sunnies can also help to add some punch to your #ootd! 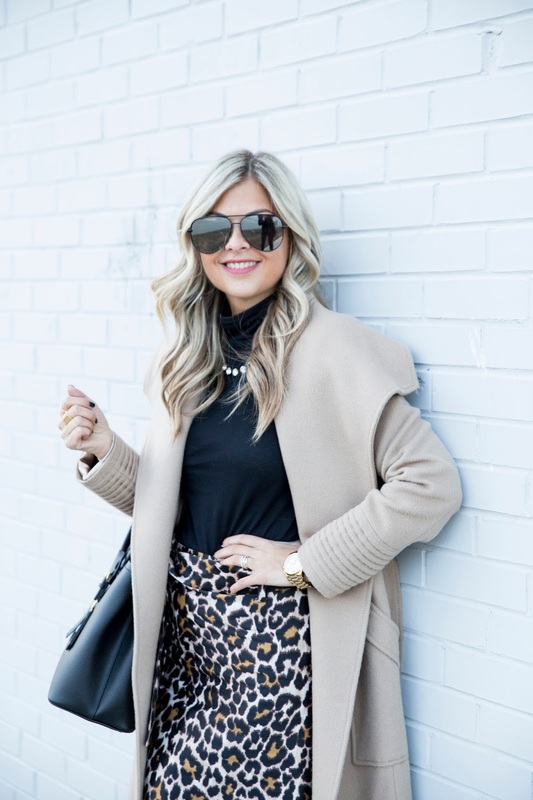 I have been struggling with my winter work wardrobe and I needed this winter inspiration! Super chic and glamorous outfit! I'm loving your skirt even though I could never see myself wearing it. This coat is absolutely gorgeous! I love everything about this outfit. You look so classy! It might be cold but this look is hot on you! Love that coat!